On 22 May 2006, what would have been George Best's 60th birthday, Belfast City Airport unveiled its new name. The signage bears Best's signature and provides a lasting tribute to this unique footballing legend who was born just up the road in East Belfast. The airport is a mere 3km east of the city centre off the A2 Sydenham bypass. There are conference facilities, ATMs, exchange office, a small selection of shops and food outlets and wifi connection. 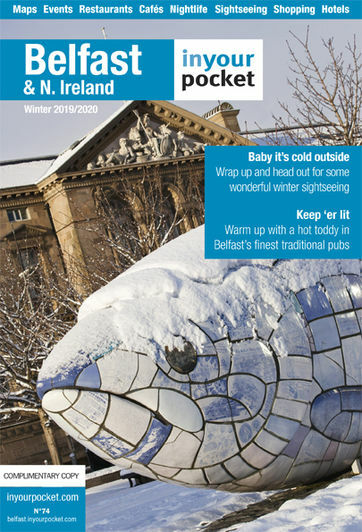 And don't forget to pick up a free copy of Belfast In Your Pocket at the very friendly information desk. Get to town by bus, hop on the Airport Express 600 at the entrance. The bus runs every 20mins at peak times Mon-Sat, reduced service Sun. Tickets cost £2.60/4 single/return and can be purchased at the Airport Visitor Information Desk or on the bus. Get to town by taxi: Approved airport taxis charge around £10 for the 10min ride into the city centre. You can take a train into the city or, in the opposite direction, Holywood and Bangor from the nearby Sydenham halt, but trains aren't as frequent so it's best to bus.